Church did not permit women to ordina- tion until 1977, and luckily Rev. Dr.
Smith was still eligible to attend semi- nary to prepare for the ordination process. "I had sensed a vocation, which could not be realized," she said. "Therefore I felt the way anyone who does not have equal opportunity feels...frustrated. How fortunate I was though that I was at an age (in 1977) where I could still attend seminary and that I was accepted." Princeton, N.J., eventually going on to serve as Interim Rector. Ministry (ITIC), which was formed in 1995 to train and educate port chaplains who service under-served ports around the globe. Three years later, Rev. Dr. Doctorate degree from CDSP as well. Director in March 1999. "SCI was my initial introduction to the industry," she said. "I have been very fortunate to have held different positions in an organiza- tion that has allowed me to know how sister organizations operate, as well as the shipping companies, agents, freight forwarders. So Although it's a new posi- tion, I'm not starting cold." Manhattan, (where SCI is located), since the tragedy of 9/11. While there does not seem to be any relief in the downward spiral of the current econom- ic state, Rev. Dr. Smith and her staff have already begun to tackle the issue by exploring alternative options. "The mar- ket is down for everyone," she said. "And I think that not-for-profits across the board are looking at limits. It only means that we have to work harder at being innovative and be willing to part- ner with sister organizations." And as the new Executive Director of the SCI, Rev Dr. Smith's mission state- ment is simple...to have a vision. "Having a vision empowers people," she said. "Expecting and realizing visions are of enormous value as well, and I feel fortunate to be able to lead a group of very skilled people who work to instill that vision." California, USA, Catalina Express demand the best in reliability and performance from their vessels. 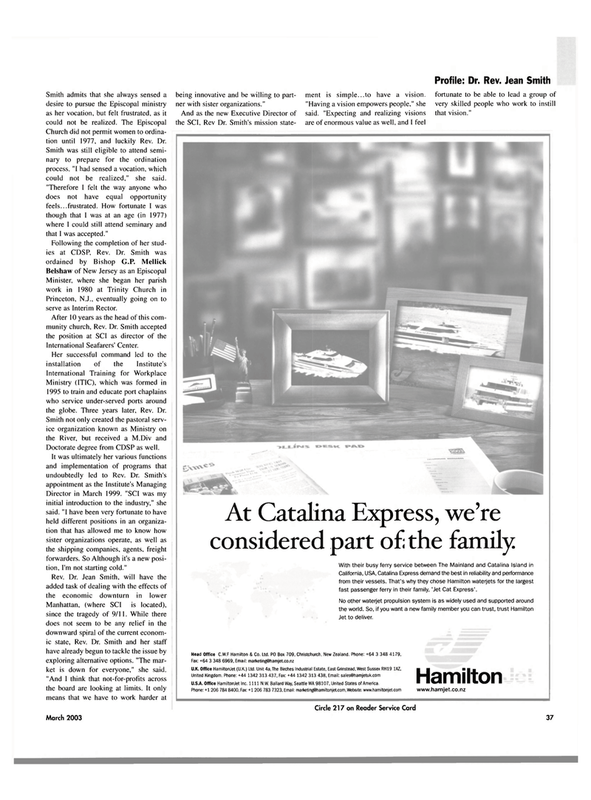 That's why they chose Hamilton waterjets for the largest fast passenger ferry in their family, 'Jet Cat Express'. U.S.A. Office HamiltonJet Inc. 1111 N.W. Ballard Way, Seattle WA 98107, United States of America.